Congratulations to Narrabundah Early Childhood School Educators Lauren Ross and Brynn Buchmayer-Hogg on their commencement of sponsored study on their Bachelor of Education degrees. CEO, Lorcan Murphy and Deputy CEO, Lee Maiden, paid a visit to our Narrabundah Early Childhood School to congratulate Lauren Ross and Brynn Buchmayer-Hogg on their commencement of sponsored study on their Bachelor of Education degrees. 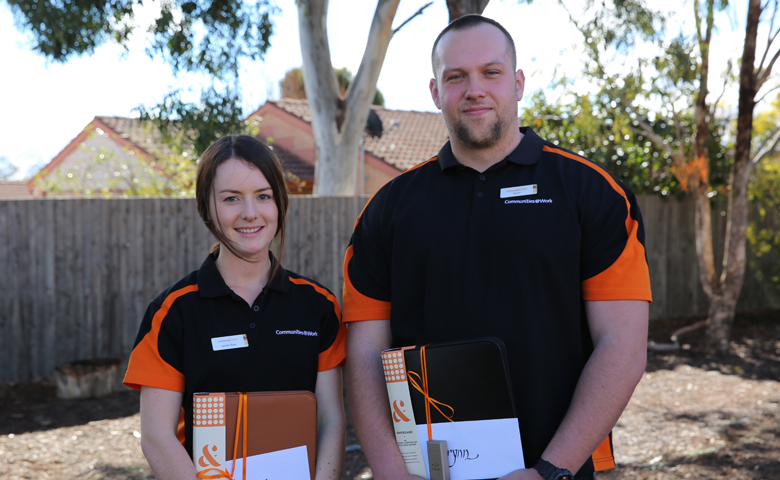 Communities@Work is sponsoring them to develop their qualifications through Charles Sturt University. This arrangement is a key component of our strategy for ensuring our services provide the highest quality education and care for the families who use our services. Educator qualifications have been identified as one of the key influencers of quality outcomes for children within an education and care setting, so we are eager to support them to successfully complete their studies. We look forward to working with Brynn and Lauren to help them complete their studies over the next four years. Their continuing experience in education and care practice will complement their studies, and we will all benefit when they bring the expertise gained through academic enquiry and apply it in our centres. Our centres and families will benefit from having staff with a broader range of qualifications, all with the same commitment to putting the welfare and development of children at the top of their priorities. Congratulations to Lauren and Brynn. It’s going to be an exciting learning journey ahead. Click here to find out more about Communities@Work Qualifications and Professional Learning.